A recent wave of deadly crashes across the Silver State has law-enforcement officials worrying about what the rest of the year might bring. In fact, 2018 is on-track to reverse the prior year’s downward trend in fatal crashes and vehicle fatalities. In 2016, the state suffered 304 fatal crashes which claimed 329 lives; in 2017, 290 fatal crashes killed 308 people. The year-to-year crashes fell by 4.6 percent and the fatalities fell by 6.3 percent between 2016 and 2017. Through June of 2016, there were 137 deadly crashes in Nevada; by the same time in 2017, the number was 145. This year, the state has seen 135 fatal crashes through June, on-par with 2016’s level. Put in terms of vehicle fatalities, this year’s trend has also been unwelcoming. By June of 2016 146 people had died on Nevada’s roads, as compared to 153 each year in 2017 and 2018. While each life lost is a tragedy in itself, from the zoomed-out perspective of policy-making and social statistics we should be “rooting” for a lower level of fatalities each year. Even though our state is among the most rapidly growing in the country, we ought to strive to lower our traffic deaths at a faster rate than we add new residents. With our eyes on the bottom-line numbers, Nevadans have to be rooting for a year-end “slump” in these deadly crashes. Again, that is what happened in 2017: the numbers were trending upward until mid-year, but in the late summer to early winter the trajectory shifted. This year could certainly benefit from such a late-year swing. As discussed above, the 2018 mid-year statistics on deadly crashes and individual fatalities match the worst levels of the two prior years. That makes the spike in the first week of September all the more disconcerting. The 16 deadly crashes in the first seven days of the month compare to 30 for the entire month of September 2016 and 33 for September 2017. 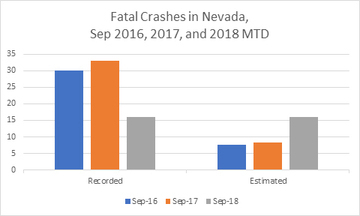 The Nevada Office of Traffic and Safety has not yet released data on the number of deaths from these crashes, though the statistics will likely appear in the 2018 year-end statistics to be released sometime in 2019. On an adjusted basis (that is, dividing the months into four weeks), this September has seen twice its share of fatality crashes. That makes it seem likely that 2018 will witness an overall increase in deadly incidents on Nevada roads. While residents across the state eagerly embrace the Zero Fatalities campaign, it appears that further advocacy, outreach, and individual change are required to push the trend-line toward zero.